Aristotle might not have been a Rock star, however, his concept of "golden mean" is not that unfamiliar to each and every musician who's ever struggled to find that long-sought-after middle-ground between staying true to their influences and their artistic development. 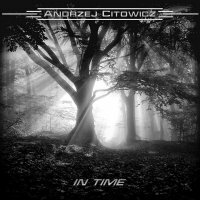 'In Time' is a new instrumental album released by the Polish-born, Cairo-based guitarist Andrzej Citowicz and is an adequate portrayal of such a struggle. Citowicz's early style has been heavily influenced by the likes of Richie Sambora and Phil Collen and, after a string of recordings built around eighties-tinted Melodic Rock, including an EP of the international project TACE, Citowicz joined forces with his former TACE band mates Dirk Arnicke and Patryk Szymanski to work on '...Time'. This time however, the destination of his journey was a bit different than before. Although the content of Citowicz's new album is no contradiction to his Melodic Rock roots, the sound and production on '... Time' both certainly have more structure and substance than found on its predecessors. This becomes obvious as the album's intro, with an atmospheric, Oriental-tinted vibe to it, kicks in. It's followed by ten subsequent pieces, each of them going way beyond the formulaic schemes that often plague instrumental albums, and simultaneously moving away from the stylistic monotony. Alongside the slightly Def Leppard-esque undertones of 'Angels Love' or the eighties-style synth wizardry of 'Fade Away', there's 'King Of The Crossroads' with its thick bass line and Funk-ish groove and 'Why Can't I' which juxtaposes sharp guitar sounds with a Phil Collins-esque drum beat. There's also a place on the album for nostalgia-driven, melancholic pieces of balladry, from the title track to the enchanting, semi-acoustic 'Silver Sail', which is embroidered with a wailing guitar solo. 'Bruadarach' is a grandiose tune with titular and musical references to Scottish folklore and ends the material on a high note. Although it's been only a few years, it seems Andrzej Citowicz has come a long way artistically since his 2012 debut 'Year Of The Dragon', released under the auspices of Warrant co-founders and their label Down Boys Records. In spite of its nods to the past, 'In Time' perfectly captures his development, not only as a guitarist, but also a composer, manifested here by stylistic diversity and more organic approach to both song-writing and recording. A genuine artistic statement and a fine exploration of instrumental guitar-oriented Rock.